Make a donation to Chilies With Nostalgic Flavor today. Film Independent’s Fiscal Sponsorship program opens the door to nonprofit funding for independent filmmakers and media artists. Donate today and help bring Chilies With Nostalgic Flavor to life. Basma, a drama therapist working in Jordan, is torn between two difficult choices: getting married to the man she loves or pursuing her dream of going back to her hometown Gaza during the war. At fourteen, Basma, daughter of a Palestinian minister, and her cousin are caught stealing mangoes from a wealthy woman’s home in Gaza. As punishment for stealing, and especially since they come from well off families, the woman asks them to plant mangoes in one of the refugee camps nearby. It’s here that Basma becomes fascinated with Karim, a boy of her age. Basma’s family is staunchly against this relationship between an upper-class girl like herself and a “camp boy” and she is forced to leave Karim – her first real loss. Later, she and her family must leave Gaza permanently, resulting in the second painful loss of her young life. Fifteen years later Basma is working with Syrian refugees in Jordan and about to get married to the man she loves. After several life-changing events, Basma finds her past and childhood memories resurfacing, urging her to think about going back to Gaza. This yearning becomes even more powerful when she learns that Karim has become a famous leader in the Islamic government Hamas. Basma is torn between two difficult choices. Does she get married to the man she loves or should she return to Gaza during the war to serve her people and be closer to the homeland to which she feels most deeply connected? Make a donation to Chilies With Nostalgic Flavor. 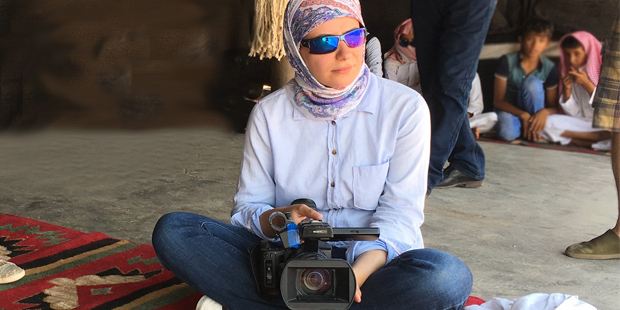 Since 2007, Asma has worked as a fiction and documentary director. She received a fellowship grant from George Washington University and in 2013 was awarded a scholarship to pursue her Masters in Directing for Cinema and TV from El Instituto Del Cine de Madrid, Spain. Her documentary I am Gaza was the opening film at Amal Film Festival in Spain and was selected for the Arab Film Festival in Oran, Algeria. The film screened in over thirteen countries and received two production awards. Her first feature documentary Aisha, which was released in 2016, received the Best Documentary Award at the Malmo Arab Film Festival in Sweden, along with five production awards. Asma is a Film Independent Fellow and participated in the 2016 Global Media Makers program with her script Chilies with Nostalgic Flavor.